Goals:I competed in my first full power competition in 2011 and loved it! After taking 2 years off from competing, due to a car accident and a few broken bones, I have found my passion for lifting heavy again! Moving from bench only to full power and learning to squat more than I can bench is my new goal. 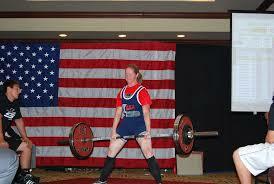 Inspiration:Powerlifting Quote:Big isn't strong, strong is STRONG!